FM Alexander (the originator of Alexander Technique) first developed the Technique to help with his voice problems (he was an actor), and since those early days Alexander teachers have been working with performers, notably actors and musicians, to help them play a part or an instrument with more ease. 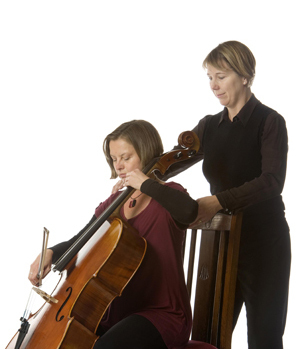 Susannah currently works with musicians at the University of Bristol’s Department of Music. The work involves observing and helping them identify postural habits that may be causing them stress and pain (or may cause them more serious pain or injury in the future), and showing them how to release tension and become more aware of their body and mental state when playing. Working on the breath is crucial for performers and Susannah will always spend time on observing breathing patterns, and helping to overcome unhelpful habits that may be impeding your performance. This is particularly important if you suffer from vocal problems. Performance anxiety amongst musicians and actors can appear from time to time, and, if this is proving a problem for you, Susannah can show you how to use the Technique to calm your nerves before a performance. I knew of the Alexander technique for a few years while studying the violin, but I never had the opportunity to experience it. I contacted Susannah after finally having enough of the discomfort in areas of my neck, shoulder, and back. My purpose for learning the technique was to reduce this pain, but I now find that my life has changed greatly. Susannah is a wonderful, easy-going, and very knowledgeable teacher who really encouraged me to become aware of how my body works and the way I was using it. Through my classes with her, I now find it so much easier to do everyday things such as walking, sitting, climbing stairs etc., that I didn’t even know could be done with such a feeling of lightness and ease. I not only feel physically balanced now, but I have more energy and a greater sense of mental relaxation as well. With respect to my violin playing, I find it much easier to release and just enjoy what I’m doing – as Susannah said a few times, with appropriate tone and not excess tension. With this new-found awareness, I certainly feel that I can move “forward and up” in whatever I do with more freedom and enjoyment. Thank you Susannah! To find out how the Alexander Technique can help your performance please call Susannah on 07919 333388 or get in touch via the contact form.